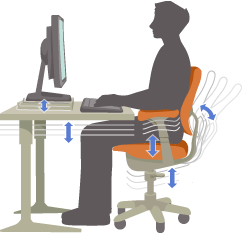 Workplace Ergonomics - What are Good Ergonomics? According to the United States Department of Health and Human Services, ergonomics is the science of fitting workplace conditions and job demands to employee capabilities. An ergonomic assessment of the workplace critically appraises the physical work environment -- followed by changes based on the assessment. Ergonomic principles are then used to make the workplace compatible with the employee, improving the employee's safety and productivity. In other words, the easier it is to do a job, the more productive and happy the worker will be. When lifting, the largest muscles in the area should perform the task. The larger the muscle or muscle group used for lifting, the lower the stress placed on smaller, more vulnerable muscles. During any work activities, people should be able to comfortably assume a number of different postures and not remain in one position for an extended time. Muscles will fatigue and be more prone to injury when assuming a particular posture, especially a poor one (e.g., partially bent forward at the waist). When performing tasks, it is important to keep the joints either in their neutral posture or approximately halfway into the range of motion. Working with your joints at the extremes of their ranges of motion for prolonged periods places abnormal stresses on them and can cause repetitive stress injuries. Choose a desk that is the proper height. All things on your desk should be within easy reach. Take micro-breaks often, stretching your neck, arms and wrists, back, and legs. Simple stretches include neck rotations, fist clenched, arm dangles, and shoulder shrugs. If your eyes concentrate on a particular object for long periods, relax your eye muscles by shifting your focus from objects that are close to you to objects that are farther away. This helps reduce eye strain. When lifting from the floor, keep your back straight and lift with the legs. Do not bend over at the waist and lift with the muscles of the low back. Your body is more easily injured in this position. Keep the object being lifted close to your body. Keep your elbows flexed. Keep your head up and your neck straight as you lift. Don't move the mouse with just your wrist. Use your entire arm and shoulder. Don't rest your arm on the edge of the desk while manipulating the mouse. Hold the mouse loosely. Keep your wrist relaxed. Don't hold it up or down; instead, hold it in a neutral (straight) position Move away from the mouse several times per hour and move your wrists, arms, and shoulders around.